The main part of the trail into Cold Springs Canyon was easy enough. We started from the same old mining road we used to access Pueblo Canyon a couple years prior, about 23 miles down a seldom used 4×4 back road along Cherry Creek. This time with a more suitable vehicle, we 4-wheeled our way up the mining road to a small, level clearing once used as a camp. From here it was supposed to be less than two miles in to Cold Springs Canyon to the Crack House. Crack House is the nickname given to the 700 year old Salado Culture cliff house ruins we were after. When you see the site, the name is obvious. 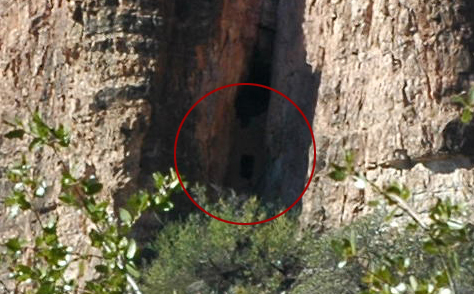 This cliff dwelling is literally built into a naturally occurring crevice at the base of a 600 ft shear canyon wall. 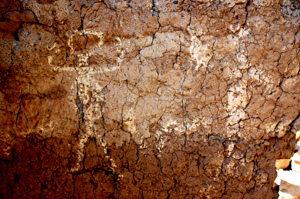 The 3-story mud, rock and timber dwelling was discovered in the 1930s and documented by Dr. Emil W. Haury as part of the Gila Pueblo Project. About a mile up the main trail you get a glimpse of the Crack House…if you’re lucky. You’ve really got to be looking for it and luckily, some of us had better eyes than the others. Jabon Eager and Mike Sorensen were with me again on this hike, the same guys I hiked Pueblo Canyon with. The only one missing from the original Pueblo Canyon party was my (now) wife, Merelyn. As the three of us hiked deeper into the canyon looking for the side trail that would lead us to the site, Jabon was the one who managed to spot the distinctive black square hole in the cliff face that marked the entrance to our ruins. Now, with a frame of reference, we excitedly continued forward. Even the primary trail is nothing more than a narrow ribbon of roughly flat ground wrapped tightly against the steeply descending canyon walls. It’s a seldom used trail that had become overgrown in some areas and we were looking for an even more obscure side trail to guide us up to the ruins. We followed the path until we were standing below the cliff ledge where we had seen the entrance to the Crack House. None of us had discovered any sign of a side trail, but as we stood below the cliffs there was what could only have been a drainage path or a rough game-trail leading straight up. Could this be the trail? Jabon consulted his print out of the Trail Description he’d found online as I consulted my topographic map. “This section is nothing short of NASTY”, is what the report says. “Nasty” is a very subjective description. To some, a “nasty” trail is any trail without asphalt or concrete. So with little to go on, we eyed this barely discernible clearing heading straight up the steep slope with trepidation and doubt. It certainly looked “NASTY”. We decided to give it a shot. I took point and scrambled up the slope, unsuccessful. Jabon followed close behind and when I ledged out, he took another path to the left with the same result. We both moved laterally toward the cliffs to find something – anything – that looked like a trail. We found many, followed some, and one-by-one discovered they led to nowhere. As we crawled along our imaginary trails, glancing up occasionally in an attempt to orient ourselves, I spotted a crack, high in the cliff, carefully filled in with stacked rock. Far too small to be our Crack House, it must have been an old granary. Granaries were often created high out of reach and used to store food for the Winter. This meant we were close. Mike retreated early, probably getting tired of dodging the numerous geological samples I was generously sending his direction. Jabon and I retreated next and as I followed Jabon back down slope I lost my footing and my bad knee gave out, crumpling completely under my weight. Aside from the intense pain and initial fear that I had crippled myself, the fall wasn’t bad and after a short rest I was able to continue on my own. Jabon backtracked looking for another possible trail and returned later having been unsuccessful. This meant there had to be a trail above us as well, we just had to find it. Jabon and I were not leaving this canyon until we’d found the Crack House. For Jabon and I, this trip had been simmering in the back of our minds for two years now, since Pueblo Canyon. We were here, no more than 100 feet below the site we’d read about and we were not going to walk away now. We both chose different lines and committed to them. He blazed up the left side of the trail we had originally attempted and I crawled up the precarious slope on the right. My knee was sore from my earlier fall and Jabon was making better progress. I keep losing my footing. The steep canyons out here in the Sierra Anchas are in an extreme state of erosion and nothing is stable. I am constantly worrying about my bad knee as I hoist myself up one precarious foothold at a time, following nothing but the whisper of a trail, not able to see my target but knowing that it is up…somewhere up. After much sweat and swearing Jabon triumphantly called down that he’d found the trail. This spurred me on and I hacked my way through Prickly Pear cactus and overgrown Cat’s Claw trees in my fight for the trail. Before long, with sweat dripping from my dusty brow, I had found it as well and quickly set off in pursuit of Jabon and the Ruins. The real path to the ruins wasn’t much better than the trail we’d been forced to blaze. It simply had the benefit of being an actual recognizable trail. It still amazes me that so much vegetation can cling to the steep, eroded slopes of these desert canyons. 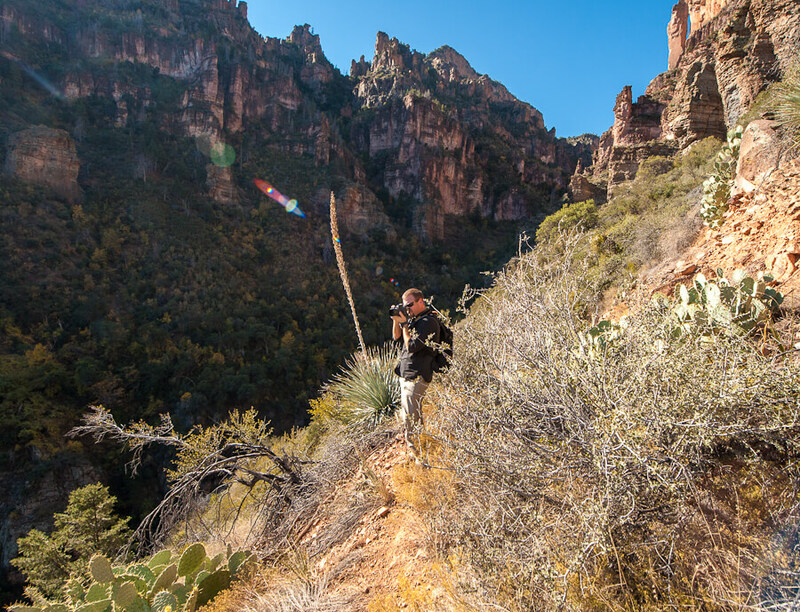 I found myself crawling through brush and vines, sliding under tree branches and carefully dancing around cacti, yuccas and agaves. Finally, after a near vertical scramble, I reached the rocky shelf that led to the Crack House. 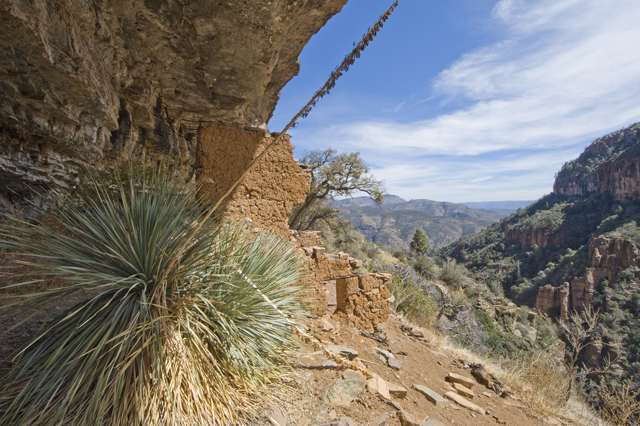 The photos say more than I can about the impressiveness of this cliff dwelling. Both of us have studied enough about the archaeology of the area to approach the site with cautious awe and respectful curiosity. Because of its protected location, the floor structures are in fantastic shape. The crack which this structure was built in cuts clear through the cliff. The main room, which is on the third floor, makes a sharp left turn about halfway through and presents visitors with a balcony window framing an amazing view of the valley to the southeast. Jabon photographed the interior of the ruin creating some of the most detailed interior shots of this site ever taken. We stayed for a short while, soaking it in, quietly reveling in our triumph. For me, there is an addictive nature to this sort of hiking. 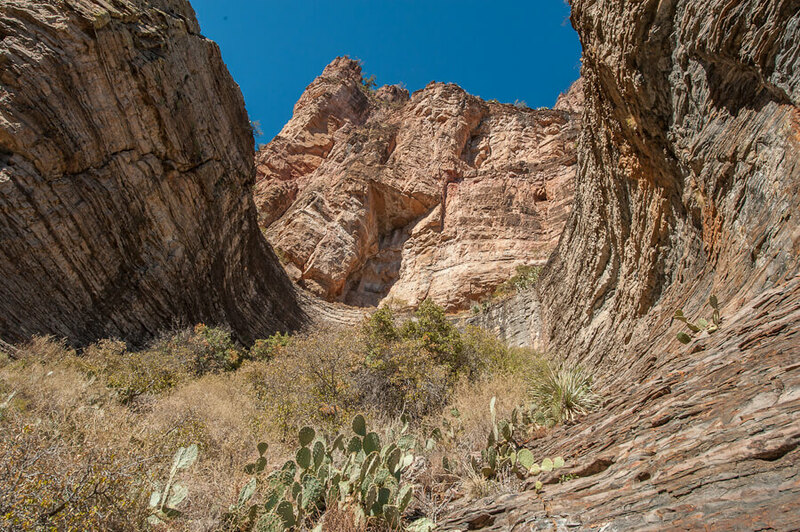 These canyons are littered with sites like this. Not all of them are as dramatic or as well preserved, but they are here. 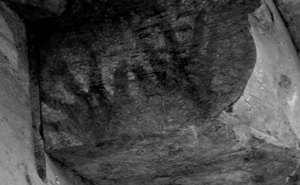 Most of these sites see so few visitors that trail descriptions are few and far between, pictures are rare, and the academic documentation incomplete. Finding them takes work. That, for me, is what draws me to these kinds of hikes. I like the research, the exploration and the satisfaction of discovery. Even though this hike was probably no more than 2 or 3 total miles of hiking, it was far more gratifying than many longer hikes I’ve been on. We concluded this hike on a high, excited to have had the experience. Our conversations inevitably revolved around where we would go next. 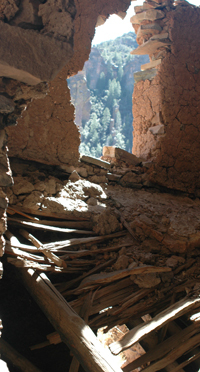 There are rumors of more ruins in Cooper’s Fork, the canyon to the east across the creek. Another rare site in rugged, inhospitable territory with no established trail and minimal documentation…sounds like a fun trip! To see more Jabon’s fantastic work, check him out on Facebook. These archaeological sites are in the condition they are in because of the rarity of visitors. I have deliberately left out a trail map and directions in hopes that these sites do remain undisturbed by the general public. Like most protected areas, their inaccessibility is their salvation. One of the lessons learned from other important archaeological sites that have turned in to tourist attractions is that people are inherently destructive. If you do visit some of these historic structures, treat them with respect.